An arena cannot be freed while it contains any live cells. Cells allocated at the same time may have different lifetimes and so a heap may end up in a state where there are many arenas that contain only a few cells. New cells of the same kind can be allocated into this space, but the space cannot be used for cells of a different kind or returned to the operating system if memory is low. Note that if the free space in arena 3 were used to hold the cells in arena 5, we could free up a whole arena. You can see how much memory these free cells are taking up by navigating to about:memory and hitting the ‘Measure’ button. The totals for the different kinds of cell are shown under the section js-main-runtime-gc-heap-committed/unused/gc-things. (If you’re not used to interpreting the about:memory reports, there is some documentation here). This shows a reduction of 29.4MiB (mebibytes) worth of explicit allocations. That’s only about 2% of total allocations, but accounts for over 8% of the space taken up by the JS heap. To free up this space we have to allow the GC to move cells between arenas. That way it can consolidate the live cells in fewer arenas and reuse the unused space. Of course, this is easier said than done, as every pointer to a moved cell must be updated. Missing a single one is a sure-fire way to make the browser crash! Also, this is a potentially expensive operation as we have to scan many cells to find the pointers we need to update. Therefore the idea is to compact the heap only when memory is low or the user is inactive. Select the cells to move. Update the pointers to those cells. We want to move the minimum amount of data and we want to do it without allocating any more memory, as we may be doing this when we don’t have any free memory. To do this, we take all the arenas with free space in them and put them in a list arranged in decreasing order of the number of free cells they contain. We split this list into two parts at the first point at which the preceding arenas have enough free cells to contain the used cells in the subsequent arenas. We will move all the cells out of the subsequent arenas. We allocate a new cell from one of the arenas we are not moving. The previous step ensures there is always enough space for this. Then we copy the data over from the original location. In some cases, we know the cell contains pointers to itself and these are updated at this point. The browser may have external references to some kinds of object and so we also call an optional hook here to allow these to be updated. When we have moved a cell, we update the original location with a forwarding pointer to the new location, so we can find it later. This also marks the cell, indicating to the GC that the cell has been moved, when updating pointers in the next phase. This is the most demanding part of the compacting process. In general, we don’t know which cells may contain pointers to cells we have moved, so it seems we have to iterate through all cells in the heap. This would be very expensive. We cut down this cost in a number of ways. Firstly, note that the heap is split into several zones (there is a zone per browser tab, and others for system use). Compacting is performed per-zone, since in general cells do not have cross-zone pointers (these are handled separately). Compacting per zone allows us to spread the total cost over many incremental slices. Secondly, not every kind of cell can contain pointers to every other kind of cell (indeed not all kinds of cells can contain pointers) so some kinds of cell can be excluded from the search. Finally, we can parallelise this work and make use of all CPU resources available. It’s important to note that this work was enabled by our shift to exact stack rooting, described in this blog post. It is only possible to move objects if we know which stack locations are roots, otherwise we could overwrite unrelated data on the stack if it happened to look like a moved cell pointer. The first two should allow us to avoid some out-of-memory situations, while the last aims to free up memory without affecting the user’s browsing experience. Hopefully this has explained the problem compacting GC is trying to solve, and how it’s done. One unexpected benefit of implementing compacting GC is that it showed us a couple of places where we weren’t correctly tracing cell pointers. Errors like this can cause hard-to-reproduce crashes or potential security vulnerabilities, so this was an additional win. Is it possible to determine in advance which cells contain pointers to cells we want to move? If we had this information we could cut the cost of compacting. One possibility is to scan the heap in the background to determine this information, but we would need to be able to detect changes made by the mutator. The current algorithm mixes together cells allocated at different times. Cells with similar lifetimes are often allocated at the same time, so this may not be the best strategy. If compacting can be made fast enough, we might be able to do it whenever the collector sees a certain level of fragmentation in the heap. It makes it easier to disable multiprocess Firefox as well at this point. This can be done from the main Preferences page. Restart the browser and open some tabs. I used ‘Reload all tabs’ to open all my pages from last time. Wait for everything to load. Open about:memory and force a full GC by clicking ‘Minimize memory usage’ and then click ‘Measure.’ Since memory usage can take a while to settle down, I repeated this a few times until I got a consistent number. 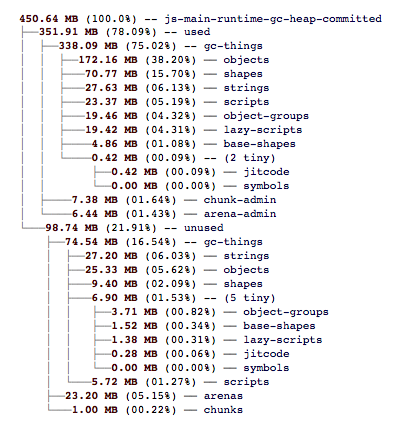 Note the total ‘explicit’ size and that of js-main-runtime-gc-heap-committed/unused/gc-things. Compare the new readings to the previous. This does not give precise readings as all kinds of things might be happening in the background, but it can provide a good ballpark figure. How does the current state of GC in SM compare to other JS engines? Any interesting differences? Our GC is broadly similar to V8’s: both are generational mark and sweep collectors, and both support incremental collection, concurrent sweeping and compaction. One difference is that V8 uses a semispace nursery, something we tried but didn’t see much improvement from. That’s just the GC algorithms though. I’m sure the details of how the GC interacts with the rest of browser are pretty far apart for the different browsers – e.g. Firefox has a cycle collector as well that deals with C++ objects which the GC feeds information to. How can I modify the number 20 in about:config or source code? This is not configurable in about:config, but comes from the time since the last user input before the user is declared inactive (NS_USER_INTERACTION_INTERVAL, 5 seconds) plus another delay before a compacting GC is kicked off (NS_SHRINKING_GC_DELAY, 15 seconds). If you want to change the how often the compacting GC runs, you should change the latter. This is interesting, I assume everything mentioned in this is in the Mozilla C code, not JS code? Are there ways to write JS that would give any advantage to this type of gc algorithm? The garbage collector is implemented in C++ and it’s part of SpiderMonkey, the JS engine. One thing that would help when writing JS is to try to allocate objects that will have a similar lifetime together and avoid interspersing them with objects that will have very different lifetimes. Doing that means we won’t need to compact so much in the first place (this is assuming all these objects survive the nursery). In general though the best thing to do is write idiomatic JS and let the collector figure it out. Trying to tune to a specific implementation always runs the risk of making the code perform worse on other implementations.